leg | meldewdesigns - Paper Craft Central! Still broken, but not AS broken. LOL I went to the doctor about a week ago for them to take X-rays and to change the cast. The x-ray showed a “cloud” around where the break is, which apparently means it’s healing. Even better? It seems to be growing in the right direction. I guess that they see broken bones growing together the wrong way or something. LOL Who knows? Well, I mentioned in my last post that a lot happened that I needed to tell about, so here goes.. ..
First and foremost, Lance and I got a puppy!! 🙂 We named him Bean and he is sooooooo cute!! Check him out here or you can see more at http://www.flickr.com/meldew . We just love him so much and are so glad that we found him in need of a home at our local SPCA. 🙂 He really is a sweetie and a cuddlebug, but he is all puppy and ALL boy!!! Plus, he has many cat-like qualities (check out the pic of him sitting in my studio window). Okay, so that’s about the dog!! 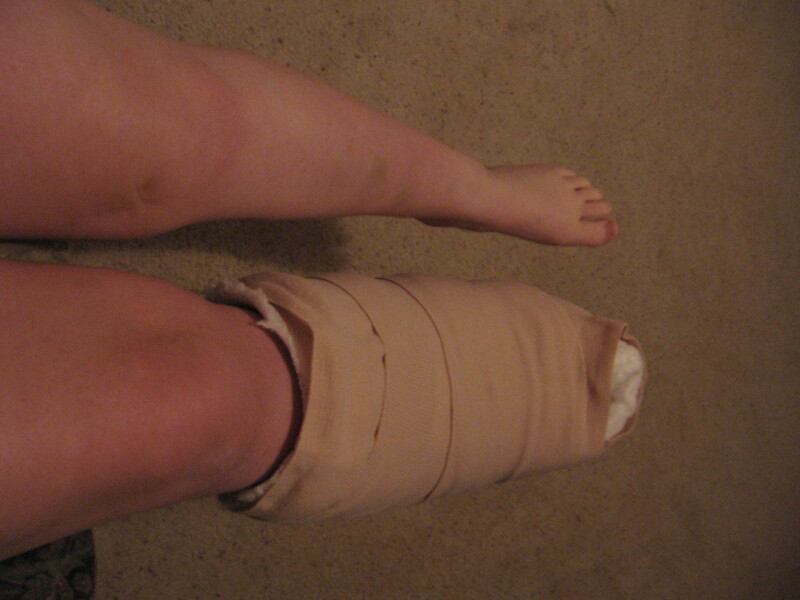 So the last thing I mentioned about my leg was that I had started walking and was in a walking cast. Some good things (and one maybe not so good thing) have happened since I last posted about my leg. Since we, of course, have a dog, I noticed one day that I had a brown stain on the back of my purple cast. I thought, “Awww, Man!! I must have stepped in some doggy poopy!” Since I was to wear the cast for two weeks after this little observation, I was not too happy about it. LOL…Later the next day, I noticed that as I took a few steps, the stain was kind of foaming…Ugh!! I thought that since I had tried to wipe off the poopy stain with a wet washcloth that maybe I had put too much water on the cloth. The next morning though, it was doing it more frequently and I noticed the stain was also now on the bottom of the cast. I should say now that I don’t have any feeling in my foot. With all of the surgeries I have had on my leg and ankle, I have had some nerve damage and just don’t have full feeling in my foot. So, I called my doctor’s office and told them what I noticed from the cast and mentioned that I don’t have feeling in my foot. They put me on hold and told the nurse, then spoke with the doctor, and then came back on the line. I heard the receptionist say, “The doctor wants you to leave whatever you’re doing and get here ASAP!”, so I did. LOL…When I arrived, they removed the cast to find that I had developed an ulcer on the back of my heel. They told me that I had caught it just in time (right after it popped, but before it rubbed through other layers of skin) and treated it. Since I now had a wound that needed the bandages changed on it daily, I needed a walking boot instead. Ahhhhhhhhhhhhhhhhhhhhhhhhhhhh!!! Can you hear the angels singing??? This was an answered prayer!!! I now walk SO much better and no longer have pain at the end of the day. On top of that, I don’t have to elevate so often either because I don’t have swelling!!! It’s just a dream!!! I am back to work VERY part-time (only about 8-12 hours a week), but my job requires me to pretty much be on my feet all day. I am a copy and print center manager for Office Depot and it’s a highly busy and active job. I can’t tell you how great it feels to get back to some sense of normalcy!! People think I am nuts for saying this next statement, but…I can do housework again!!!!!!! 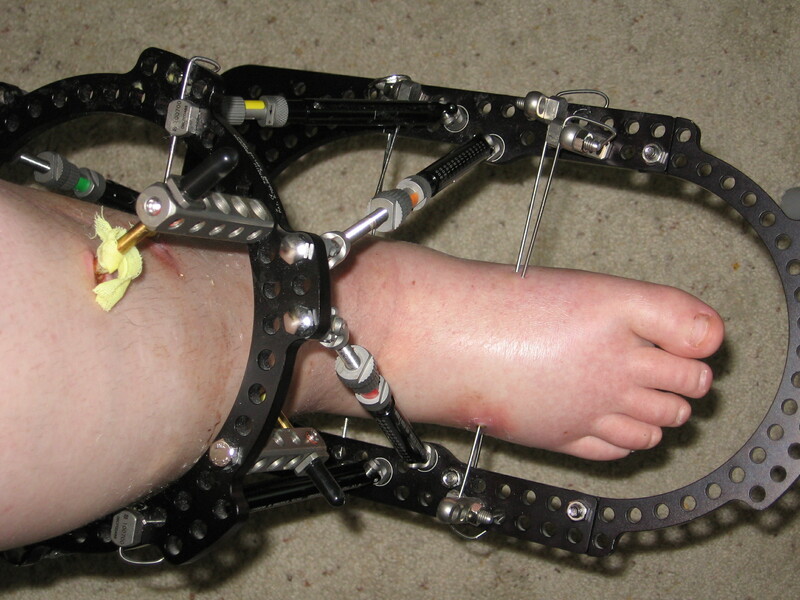 It was such a struggle for 14 months because of…well, just imagine this – you can put NO weight on your right foot because it is angled downwards like a horse’s foot, so you have to essentially hop around on one foot. On top of that, you have to hold on to a walker with both hands to balance yourself and to do some of the work of walking. Because of this, “picking up” isn’t something you can do, nor is cooking, cleaning, laundry or many many other things around the house. Heck, I couldn’t even get up the stairs in my two-story house; I had to crawl up the stairs. It was pathetic!! Since my leg is doing so much better now, I can slowly start increasing my hours at work until I am back to working full-time – eventually!! 🙂 So between work, my new rediscovery of housework and dog-owning, and the occasional rest every now and then, I have kept myself pretty busy. Some days I almost forget to get onto Etsy for a bit. I LOVE Etsy and always want to be on it, but it just feels so good to not have to be sitting all of the time, that I find myself being drawn away from it a little bit lately. I am constantly having ideas pop into my head of things I want to make and destash I need to sell, but I just don’t go make myself do it. Does that sound selfish?? I just want to enjoy the pleasure of walking as much as I can without pushing myself….I know that it probably sounds terrible, huh? ?